01 | August | 2018 | H.A.W.K.S. 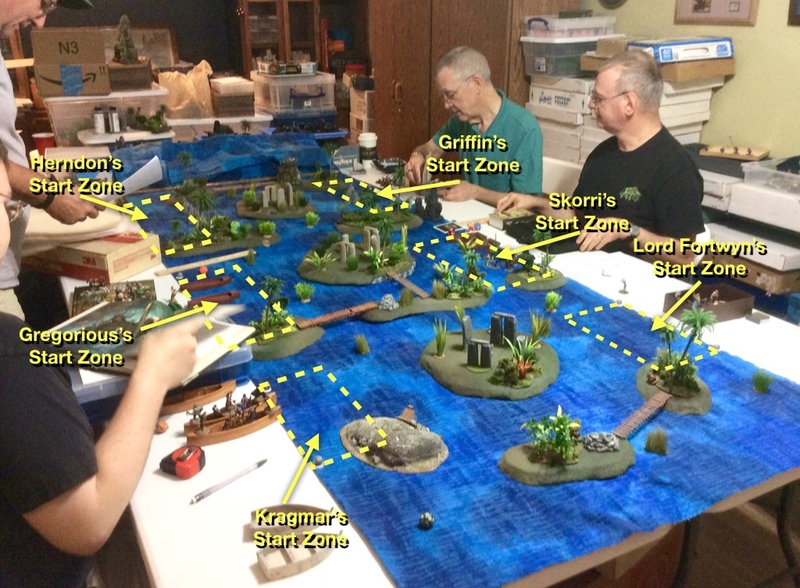 Chris Palmer This past weekend we got together for the seventh game in our Ghost Archipelago campaign. We had 6 of our regular 8 players in attendance. We continued to work on the scenarios in the rulebook, moving on to the fifth one: The Stone Circles. We used an 8’x3’ table, with three players on each side. 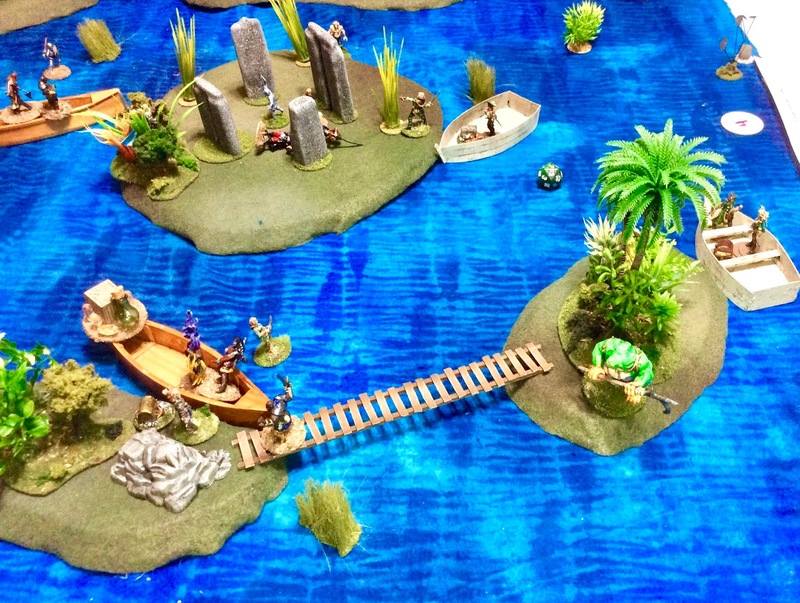 As per the scenario instructions, the 3 Central Treasures were placed within circles of standing stones which stood upon low hills; though instead of the 6" deep water moats and pools that the rules suggest, we decided to just make the entire table a deep water table, and the hills we turned into islands. I was relatively lucky in drawing for starting position, getting fourth choice. This gave me the opportunity to know where three of my opponents would be located, yet still have 3 seats to choose from. I selected a spot on the last remaining corner, with two treasures in apparent easy reach, and two more obtainable with a little effort. Whether I could get to the central treasure would be an on-the-fly-call, depending on how events unfolded. Kragmar of the True Blood, and his Storm Warden, Samael Gale ended up across from me; and Skorri Drakenburg and his Beast Warden, Agger, were on my direct right. The Heritor Herndon, and his Warden Arwhine, were across from Skorri, putting them to my front right. The Heritor Gregorious and his Storm Warden, Missy; as well as the Heritor Griffin and his Wave Warden, Ashalla were down the far end of the table. A view of the table and set up areas. The Elven Heritor, Lord Fortrywn, rapped his finger on the rail of the Silver Sword as he gazed across the misty waters off the starboard side. He had been told the mystical standing stones were located upon a large island, placed in circular patterns upon small hills with moats around them. And while technically, the stones were on small hills, and there was water surrounding them, it wasn’t so much a single large island they were on, as a chain of dozens of little hill-like islands, some of which had the circular stone henges on them. Had the big island flooded? Sank? The mysteries of the Ghost Archipelago continued to amaze and frustrate the Elf Lord. The Silver Sword could go no further in the narrow channels, so they would need to get the small launches into the water. And that would mean delays. It was thirty minutes later that they were in the launches and heading for the nearest island upon which one of the stone circles stood. The tall stones rose from the island’s center, ancient and worn. Lord Fortrywn divided his crew into two groups; thinking that taking only two launches would be more prudent. The Heritor didn’t want anyone getting lost in the maze of small islands, and he remembered the fiasco that had been the expedition to the Island of Floating Hulks were he had split the group into three boats, and they had been systematically cut to pieces. Lord Fortrywn had lost Gwyn that day. The old Elf sighed at the memory, and closed his eyes for a moment. He suddenly felt as ancient and worn as the large upright stones looming in the mist before him. She had been there at the start, the most loyal. The Heritor shook his head, and regaining himself, he turned and looked at the crew behind him and in the boat to his port side With himself he took the Hunter, Bindidell; and the dependable Crew-woman, Arbyn; as well as the Crew-woman, Meriwyn. He assigned to his Niece, Marny’s boat, (she was also his Vine Warden); the Archer, Tannin; the Crew-woman, Bry; the Crewmen, Finil; and Crew-woman, Lilisea, who was on her first expedition ashore. Between the two boats, swam the Pearl Diver, Salin. He felt he could make better time using his own powerful muscles than relying on the slower launches; so had urged Lord Fortrywn to allow him to forego riding in one of the smaller boats. Lord Fortrywn’s deployment, and the location of the closest treasures. As they neared the island, Lord Fortrywn surveyed the area, and motioned to Marnilyne, his niece and Warden, to steer her boat to the left, over towards a pair of islands that were linked by an old rickety wood bridge. The Heritor direct Salin, the Pearl Diver, to swim over to a similar pair of linked island on their far right, while Lord Fortrywn directed his boat to row directly at the central island with the standing stones. As the Warden’s boat bumped the rather steep edge of the nearest island on the left, Crew-woman Bry was first to leap ashore. She couldn’t believe her good fortune as she nearly tripped over a small chest half buried in moss and jungle undergrowth. Quickly the Elf pried it lose. Following her ashore in quick succession were Tannin, the Archer, who took up a position to offer covering fire in a small patch of jungle covering the center of the island; then the Crew-woman Lilisea, who made her way through the jungle after Tannin; and last from the boat was Crewman Finil, who circled around the far aide of the island. Gazing over at the nearby larger island, the one her Uncle was heading to, Marny could see shadowy figures in the morning mist climbing the far bank of the island, and knew another crew was approaching. Quickly, the Warden spoke the spell of Plant Walk, causing a small patch of tangled vegetation to slowly crawl around the outer edge of the large island, in an attempt to slow the progress of these new arrivals. 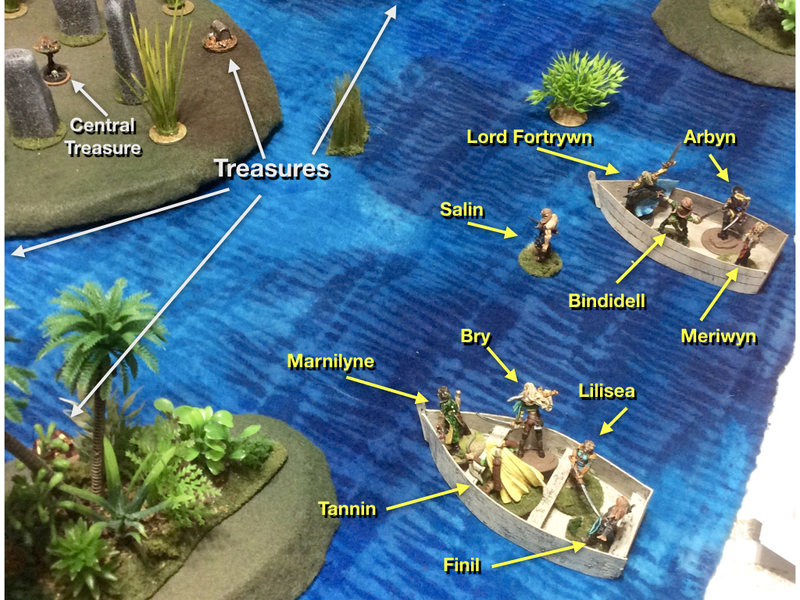 Opening moves, Turn 1: Marny’s crew disembarks on the first small island, where Bry grabs the closest treasure, and Lord F. heads his boat towards the central island. Salin is in the water and about to swim towards the left side of the photo. Lord Fortrywn could see the opposing crew as well, and cursed his luck, and cursed the delay that had set them behind that morning. The Elf’s aggravation grew as he saw the big red-skinned Heritor, Kragmar of the True Blood, stride up the far side of the island and enter the stone circle. The Elf Lord’s aggravation turned to shock as suddenly a glowing blue spirit form, wielding a translucent sword materialized in the center of the circle, and lunged at Kragmar, putting a large slice across the enemy Heritor’s gut. (I rolled a 20 for the Spirit Warrior, doing 14 HP damage to Kragmar!) Through gritted teeth, the big red warrior shouted to his crew behind, saying, “Get up here!" 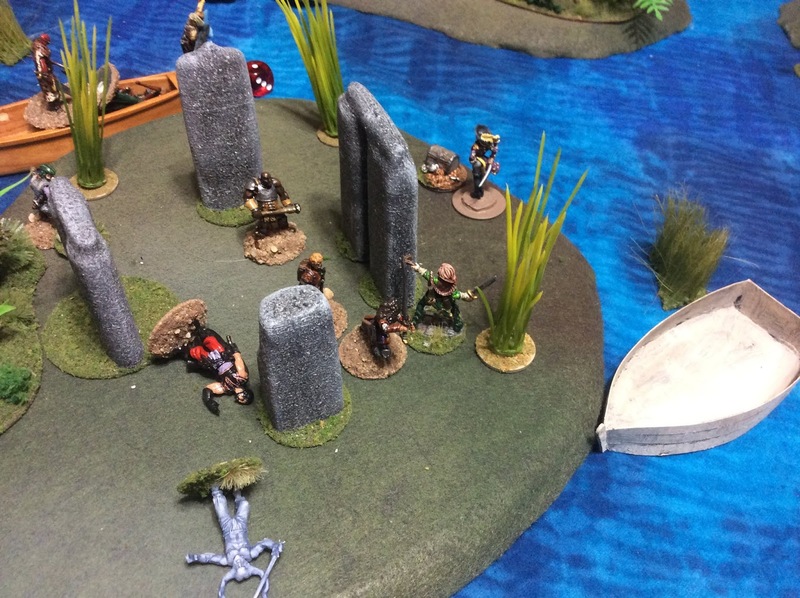 The Lord Fortrywn then noticed the low boat on the far side of the island, from which three big burly fighters now spilled onto the shore to help their master. A lone Archer was left in the boat, and a spark of an idea formed in the Elf’s’s mind, as he came within just couple yards from the island. Suddenly the skies began to boil with dark clouds, and Lord Fortrywn, feeling the tingle of magic, knew someone had cast a Cloud Cover spell. Probably Kragmar’s Warden he figured. In just a few seconds more, The Elves’ boat hit the shore, and Lord Fortrywn bounded out, almost immediately he came upon a small chest half buried on the shore, and without breaking stride, pointed at Arbyn and then to the wooden box. The Crew-woman knew what to do, though was a bit shocked to see her Heritor head not for the stone circle, but instead for the small boat with the lone Archer in it. It took the Arvyn but a second to figure out what he was going to do: deny Kragmar his primary means of getting off the island. As Lord Fortrywn headed for the enemy’s boat in the growing gloom, and Arbyn recovered the treasure, Crew-woman Meriwyn selflessly interposed herself between Arbyn and the enemy Archer in the boat; just in case he should get any ideas of denying them their find. As Kragmar and his crew tangles with the Spirit Warrior in the center of the standing stones, Lord Fortrywn tries to do an end rush and grab the enemy’s boat. 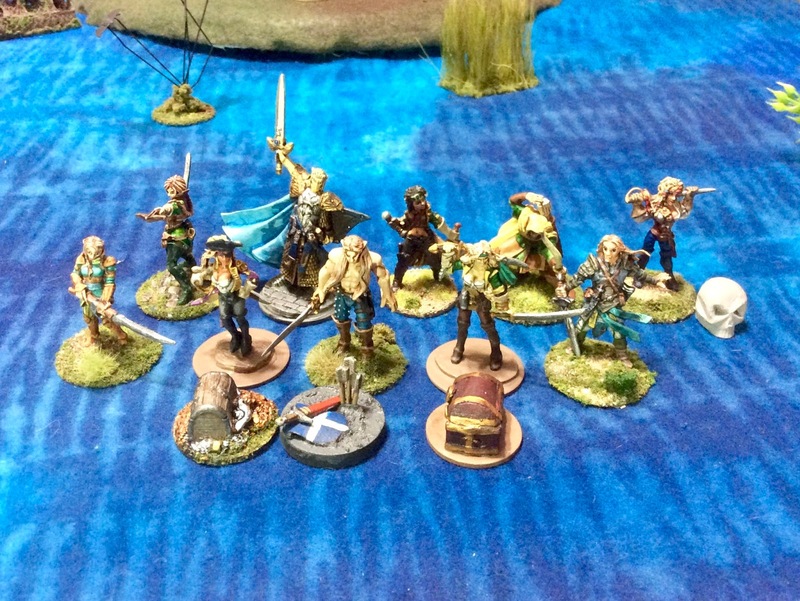 Arbyn grabs the treasure on the back side of the island, as Meriwyn interposes herself between her crewmate and the enemy Archer. On the top right, Bindidell takes up position behind a tall stone to fire into the melee. 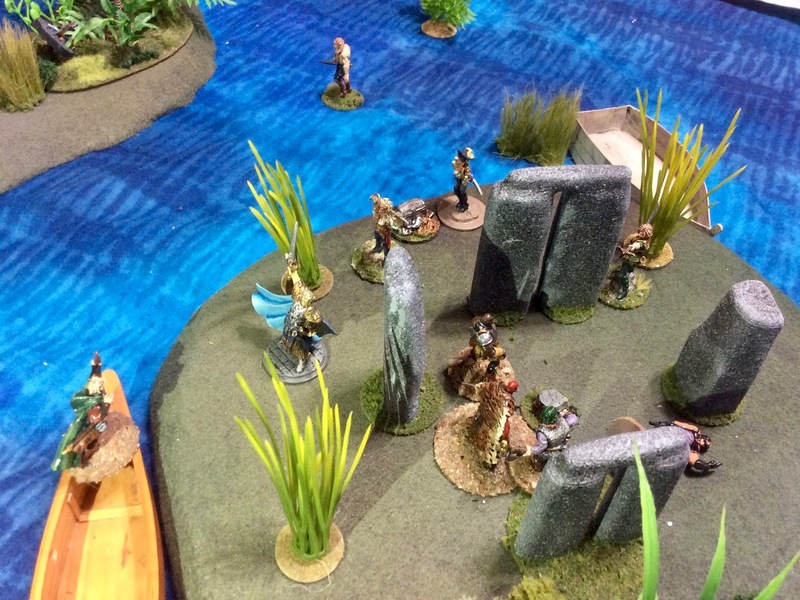 In the background, Salin swims towards the island where he will find the magic sword. The enemy Archer, seeing the onrushing Elf , notched an arrow and let it fly. The shot found a joint in the armor of Lord Fortrywn’s right arm at the elbow, and just sliced along the edge, leaving a deep bloody furrow. (-5 HP) In two more leaping steps, the Heritor hopped upon the prow of the boat, and swung his sword down at the Archer. The enemy bowman ducked low, and came up with his dagger, this time getting Lord Fortrywn in the knee, and cutting another gash into him (Another -5 HP) The Heritor’s blood began to burn, and he Surged forward with a powerful thrust, sinking his Elven blade deep into the Archers chest (Rolled 17 + 5F=22) The man toppled over the side of the boat and sank into the murky water. By now Kragmar, and four of his men had killed the Spirit Warrior; at the cost of another Crewman. With a grunt the enemy Heritor pointed at the small bejeweled stone head which sat at the center of the stone circle, and turning, made his way towards his boat along with one of the other crew. The second Crewman moved forward and began to heave at the jeweled head, while a third Crewman, and an Infantry-woman rushed towards Bindidell, who still stood behind the tall standing stone. As the Hunter saw the two adversaries approach, she drew her 2-handed sword. The Elf seemed to adopt a defensive stance but at the last minute switched, and taking the offensive, lunged at the enemy Crewman, . The man was caught off guard, and though the blade barely sliced his jerkin he lost his balance as he leaned away from the swipe of the Elven steal and staggered a few steps backwards. (I won the Fight roll, but did no damage, then pushed the enemy back.) The Infantry-woman was now right on top of Bindidell. and hacked downward at the small Elf. Quickly, the Hunter brought her big sword around, and blocking the other woman’s blow, she repositioned her own blade and thrust it deeply into her enemy’s side. (Rolled 17 + 2 Fight +2 Damage =21.) The Infantry-woman stumbled backwards, clutching her bleeding torso. 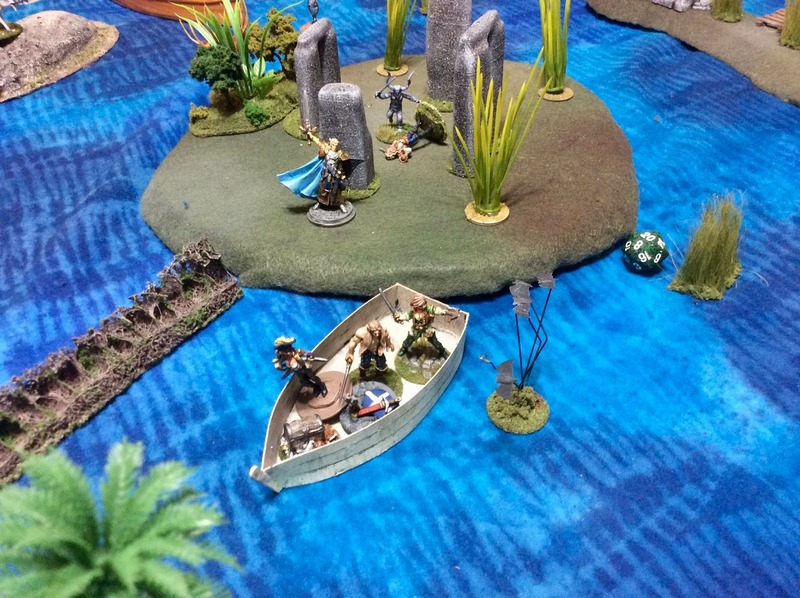 As Arbyn drags her treasure back to their boat, and Kragmar arrives at his boat where Lord Fortrywn has just dispatched the Archer, Bindidell suddenly finds herself the target of two of the enemy crew. Before Bindidell could recover her stance, another Wind Blast from Kragmar’s Warden, Samael Gale, hit the Hunter squarely, catching her unprepared. The gust picked the Elf clean up off the island, and tossed her almost 25 yards away; dropping her right into the water as easily as if she had been a leaf. In the small boat not that far away, Marny had a clear view of the two adversaries on the island who had been fighting Bindidell, who themselves seemed almost as shocked at the Elf Hunter’s sudden flight, as the Hunter herself had been. Chanting under her breath, the Elf Warden cast Warp Weapon on the wounded Infantry-woman, bending her sword into useless scrap metal. (I rolled a 9.) On the small island behind the boat where Marny was, Tannin tried a long shot at the enemy woman, but in the dark cloud cover, missed his mark. Soaking wet, with green swamp-weed clinging to her hair and clothes, Bindidell climbed from the water and up the shore of the island. Pausing, she unshouldered her bow, and quickly laying an arrow, released it at the Infantry-woman. It hit the target squarely, sending the enemy reeling backwards where she fell and lay in the island’s tall grass. After Bindidell bests Kragmar’s two crew and pushes them back, Kragmar’s Warden blows the Hunter clean off the island. Meanwhile, Lord Fortrywn didn’t even have time to unmoor the enemy’s small boat, before Kragmar himself leapt directly into the middle of the vessel causing the little craft to rock wildly back and forth, nearly pitching the Elf Heritor into the water. One hand on his sword hilt, the big red barbarian Heritor glared at the unwelcome passenger as first one and then a second of his crew got on board with their master; the second Crewman was carrying the bejeweled head. Lord Fortrywn could see the enemy Heritor was still bleeding from the gash the Spirit Warrior had given him, and the Elf was all too aware of the wounds he himself had received at the hands of the enemy Archer. With a grunt and a nod of his head, Kragmar indicated to the man at the fore of the boat to cast off, as the man who had been carrying the treasure, now picked up a pair of oars. Quickly the Elf calculated his odds; there were three of them, but Kragmar was wounded, though he was wounded too. He cursed in old Elvish, and turned to see the water between the boat and the island getting wider. The time for action had arrived, and turning, Lord Fortrywn leapt for the receding shoreline of the large island. Lord Fortrywn suddenly finds himself being rowed away by superior enemy numbers. Back on the pair of linked islands that Marny’s boat had headed for, Lilisea had reached a chest on the second island of the pair, but a boat carrying the enemy Warden and a pair of Crewman arrived at the same time, so a bit of stalemate ensued, as everyone eyed each other, and no one dared be the one to turn his back to pick up the treasure. Finil arrived just in time to reinforce her, but no sooner had he arrived then Kragmar’s Warden cast a Wind Blast upon the Crew-woman, sending her spiraling head over heels across the prow of the enemy’s boat and into the water. Back on the island they had originally landed on, Tannin still held his position in the patch of jungle. Suddenly, on the far side of the trees, he heard a rustling, and a groan like noisy bellows, and from under a pile of sticks and vines, a sleeping Swamp Troll sat up and yawned. All the activity on the island must have woken him. Quickly, the Archer moved to get a clear shot, and releasing an arrow, struck the Troll in the arm. (-4 HP) Now the Troll was awake, and standing to his full height he let out a loud bellow. Nearby in their boat, Marny cast Brambles in the channel between the standing stone island and the bridge connecting the two side islands as a precaution to block the waterway from pursuit by any of the enemy vessels. A view of the battle around Turn 4. The Swamp Troll has just woken up on the first small island on the right. Over by the enemy Warden’s boat, Lilisee came to the surface and spat out water. In the boat, the Warden was casting again and tried another Wind Blast, on Finil this time. But the Elf Crewman held his ground despite the hurricane like gust that assaulted him. With that attempt failing and Finil being all alone, one of the enemy Crewmen in the boat leapt onto the shore brandishing his sword and lunged at Finil. The Elf Crewman’s ears rang from the wind blast, and he tried desperately to get his sword around to defend himself. The Elf was a second too late though, and the enemy’s blade slid along his weapon and sank into the his side. As the enemy’s blade struck him, Finil twisted his wrist so his sword tilted up slightly, and as the enemy thrust towards him, he caught the man in a moment of overconfidence, and used the enemy’s momentum to drive his own Elf blade into the enemy’s gut. The man’s eyes widened in pain and he pulled back, as Finil too staggered a couple steps away. (Both of us roll 19 and do -9 HP to each other.) Both adversaries tried to remain standing despite the severe wounds. As Finil fought the enemy Crewman, Lilisea swam toward the enemy boat, and gracefully climbed up the side. Before Samael Gale, the Warden, knew she was even there, the willowy Crew-woman gave a mighty thrust with her 2-handed sword and speared the spell user through his torso. Back on the other nearby little island, Tannin found himself almost face to face with a very angry Swamp Troll. Thinking quickly, Marny spoke the Bramble spell again, and as the big monster prepared to club the Elf Archer, thick ropey vines shot from the earth at the Trolls feet, and began to curl upwards while sprouting with long spike like thorns. The Troll was confused and didn’t know quite what to do with this new obstacle, which nearly obscured his target. The fight in the enemy’s second boat. 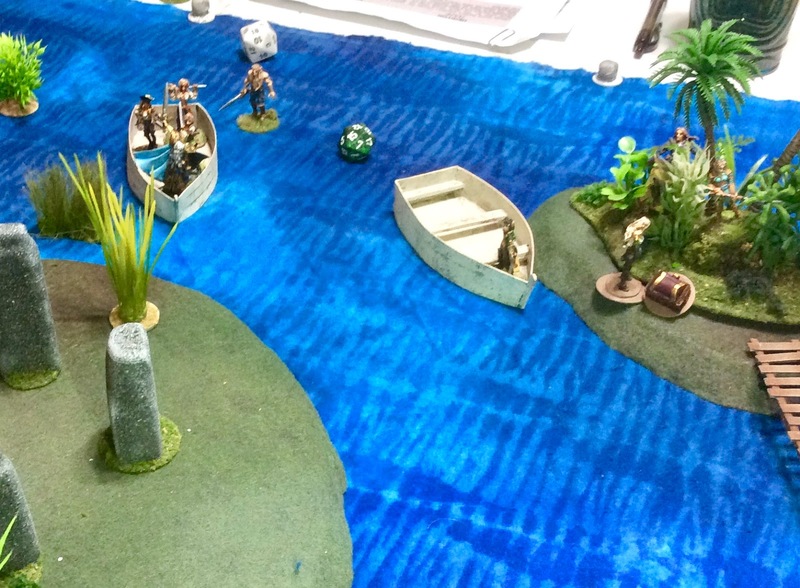 Lilisea guts the enemy Warden like a fresh caught fish, while the wounded Finil and enemy Crewman fight on the shore. Back on the big island, Lord Fortrywn, Bindidell made their way to the waiting boat where Arbyn and Salin were waiting, giving the stone circle a wide berth. Within the circle, the noble Meriwyn dodged to and fro, sparring with the Spirit Warrior. Lord Fortrywn was just a few yards from the boat, and Meri knew it was time to get out of her predicament. Gracefully leaping up, and holding her sword with two hands she dove at her ghostly opponent. With satisfaction she watched the shocked look on the spirit’s translucent glowing face as her sword plunged down into its body. It was just a split second later that she realized the awful truth; the Apparition’s weapon had also found it’s mark, and the glowing blue blade now ran from just above her pelvis and upward out her side below the back of her ribcage. With a sight gasp she crumpled to the ground. The Spirit Warrior’s glow dimmed and faded but it did not dissipate; it simply hovered above the spot where the now-missing stone head had been, seeming to be weak and indecisive. (Both opponents roll 20s, KO-ing Meriwyn, but leaving the Spirit Warrior with 2 HP left.) While the creature wavered, Lord Fortrywn rushed over and grabbed the limp Crew-woman’s body and bounded with her back to the boat. Meanwhile, those waiting in the nearby boat found themselves being plagued by a large Blood-drinker Bat. It shot like an arrow out of the gloom straight for them. Wielding her 2-handed sword, Bindidell swung at it, but merely swatted it. (Won the Fight, but did no damage) The Bat dodged back and flew a few dozen yards into the air. The Hunter grabbed her bow and took a shot at it, but missed. The creature seemed to hesitate, apparently realizing the threat that these potential victims posed, and contented itself to merely hover in the air considering its next move. 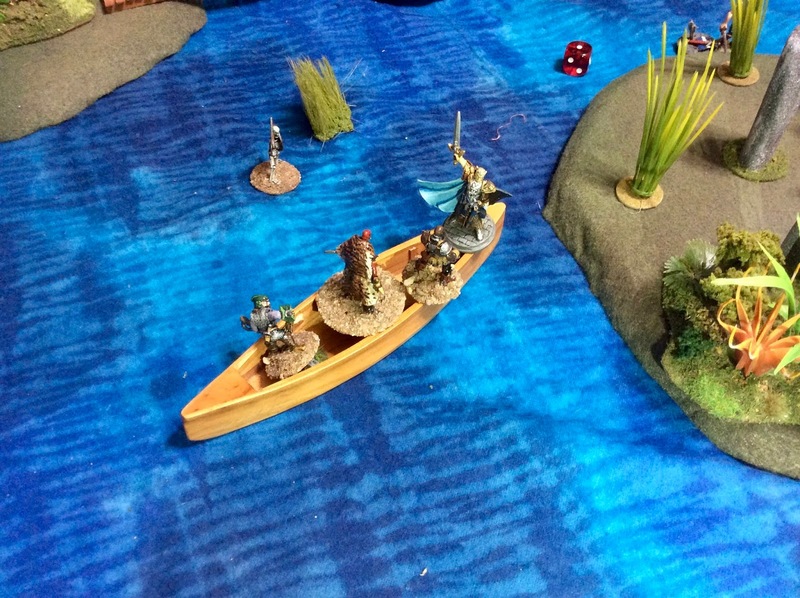 As Lord Fortrywn nears the boat, the Spirit Warrior takes out Meriwyn, and a Blood-drinker Bat menaces the boat. 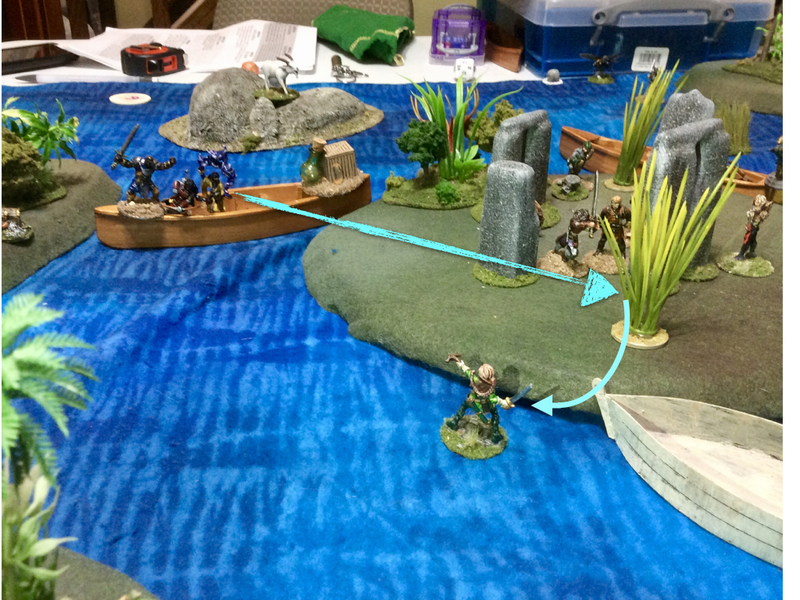 Back on the second small island, Finil gathered his remaining strength (1 HP remaining), and made a last stab at his equally badly injured enemy, finding his mark and knocking the man into the water. With heavy breath he collapsed to the grass, exhausted, and forgetting all bout the treasure which lay partially concealed nearby. Slowly he began to crawl back towards the first island where he knew Marny was waiting with the boat. In the meantime a second enemy Crewman (the one that had fought Bindidell on the big island a couple turns earlier) swam up to the boat where Lilisea was, and she suddenly found herself about to be outnumbered. Seeing Lord Fortrywn and the others departing in their own craft, the Elf decided discretion was the better course, and jumped over the side, and swam for safety. The end results. Three treasures recovered, and Meriwyn the only figure that goes down during the game. Marnilyne nodded grinning ear to ear. Lord Fortrywn slowly leaned forward and gently picked up the first small chest. It was locked, but the fittings were so rusted, that he was able to slide his dagger into a gap in the back of the chest, and with a little of his Heritor’s ability, broke the hinges clean through. He slowly pulled back the lid, and saw the glimmer of gold inside. There wasn’t much, but still, 20 GP was better the nothing. He turned his attention to his Niece. “All in all a successful day. Any word on our wounded? How is the Crew-woman who was struck down by the Spirit Warrior?" "Lord Fortrywn nodded, “Good. Good." We will need everyone at full health soon. I’ve been researching a fabled graveyard of the Eritherean people. Not only are their tusks highly prized, but they are known to lay relics with their dead, to pay for the passage to the afterlife" There may be clues to the Crystal Pool among them.” He paused, and thought to himself for moment, considering some detail of legend, then went on, leaning forward towards his Niece, “We will be heading to find it at first light, so you should get some rest”. With that, the girl jumped up, and obeying her Uncle, slipped out the door and gently shut it behind her. It turned out to be quiet a fun game! And another personal best, with 3 treasures retrieved. I have to say I enjoy the game much more when my warband’s not being used to clean the jungle floor! I was actually rolling dice competitively this game instead of being out-rolled at every turn. I think another reason I enjoyed the game a little more, was that due to the nature of the scenario, and the terrain layout, the game quickly evolved into 3 two-player games. So much so that once initiative for the turn was established, each pair kind of worked through the individual turn phases at their own pace, only stopping at the end for everyone to catch up again. I wanted to add a note about Lord Fortrywn’s unfortunate boat ride. I wasn’t shocked to see Kragmar and his crew head for the boat with the Central Treasure, figuring I was in for a fight. What I was surprised to see, was his refusal to initiate a fight. But I have to say it was a pretty clever move on the part of my opponent: he didn’t have to fight! While both our Heritors were badly wounded (Kragmar -14HP for fighting the Spirit Warrior, and me -10 HP from the Archer. ), he outnumbered me with two extra crewman. 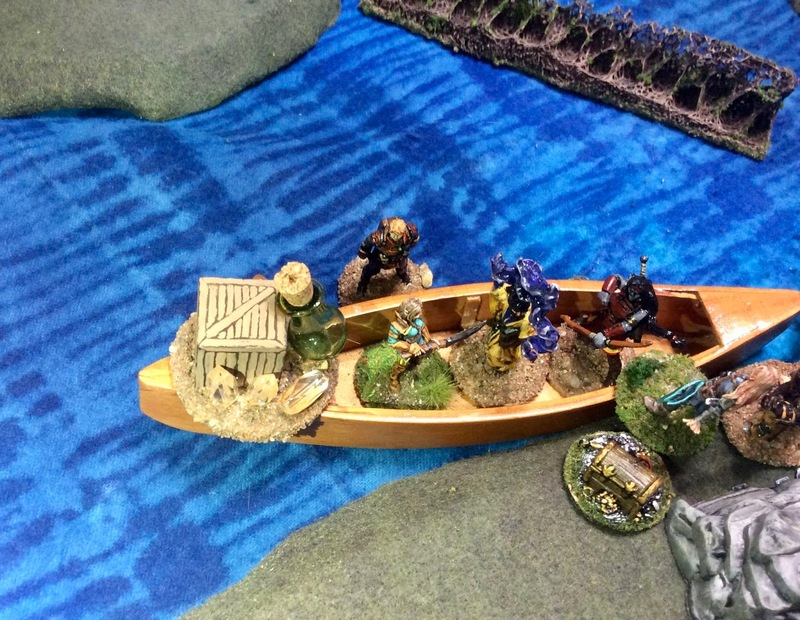 The real problem for me was his boat was two turns from the table edge and there were three opponents. I knew the odds of me defeating all three were low, but I would have been tempted to try; but the odds of me defeating three of them in two turns was astronomical. So I had to make a quick decision and that decision was to jump for the island. The game really was a close-in engagement, due to a large degree to the scenario; particularly the treasure placement restrictions so close to the central stone circle, and the respawning of the Spirit Warrior every time it was killed. Next month promises to be very similar with the majority of treasures being placed within a 12"x12" temple, and the temple floor being littered with knife-sharp bone shards. The game had a very sudden death ending when the last of Gregorious’ warband left the table in turn 6. So, Kragmar and I were kind of left hanging with the treasure on the second small island unclaimed at the end. Because of this, I had to take some liberties with my narrative report and have added a few bits that weren’t in the game but were needed to wrap up the story; like Finil being too weak from his wound to remember to pick up the treasure, and Sir Fortrywn grabbing Meriwyn off the island before the boat left, as examples. Hopefully that won’t disturb anyone’s enjoyment of the report. See you all next month!